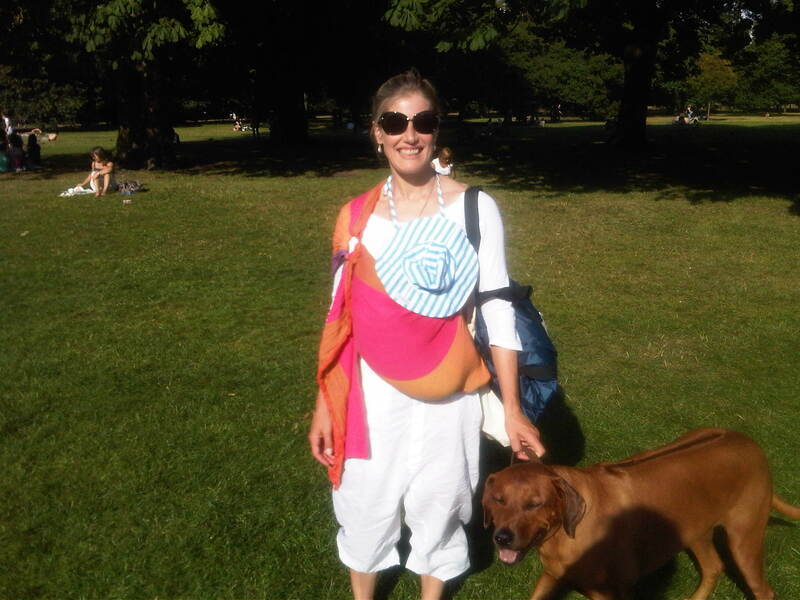 Here I am in the park, with our wonderful dog, a little sun hat tied around my neck, to keep baby in the shade. New Borns are too small to keep it on affectively, so this was a really great tip I learned from Maverickbaby.com where I got the hat. Baby is lying across me in the ring-sling, fast asleep. Here I am wearing the wrap, baby is a bit bigger, so he’s able to wear the hat himself now. We’re walking in Cornwall. I show this photo to illustrate that you can wear them no matter what the weather. Because the organic material ones (the only ones I would recommend) are breathable, you don’t get too hot, even in weather like this. Sure it’s a bit hot between you and baby, but no where else. The breathable material also means baby can breathe if his nose or mouth is against the material, although I always try to keep his nose and mouth clear. Here I am illustrating to a friend how to put on the wrap. I am kissing baby’s head to illustrate how high up the baby should be on your body. It is much better for your back, and the weight distribution works much better that way, so baby feels much lighter. 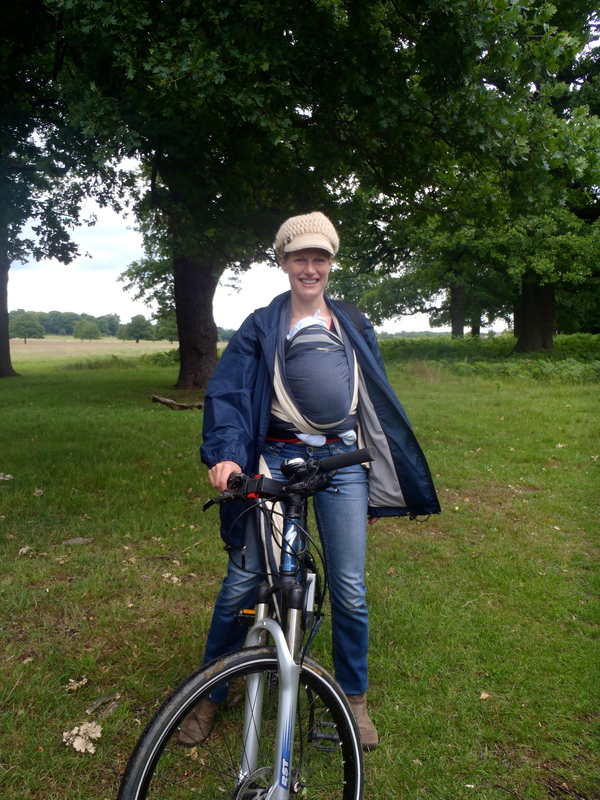 Me biking in Richmond Park with baby, while my husband had our 3 year old on the other bike. 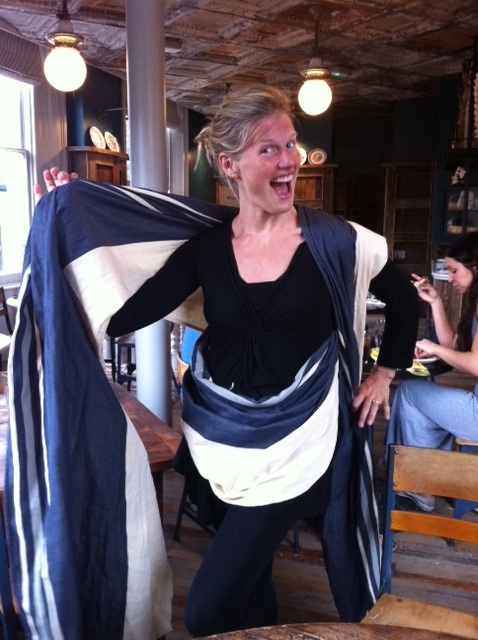 It’s a wonderful feeling to still be able to partake in healthy family activities. .
And the wonderful thing about these slings, is you can use them as an accessory! This ring sling is my favourite because of the gorgeous colours. This is us at the Goodwood Festival of Speed last Summer. Me on Portobello Road. Couldn’t resist these shots, because they show how the wrap is tied around me so well, and because of the great colour co-ordination!! 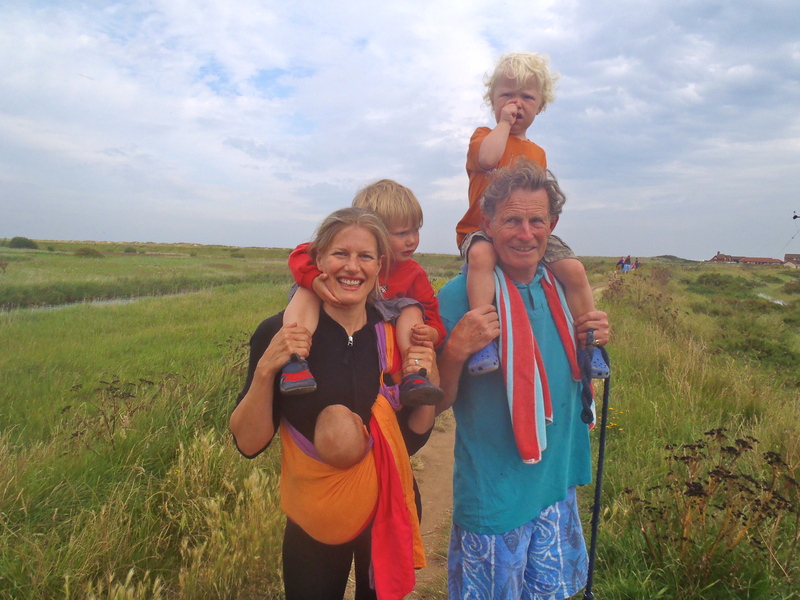 Here we are walking in the Marsh Lands towards Brancaster beach, in Norfolk. Baby, now holding his head well on his own, and very curious, wants to know what is going on and so his head is out. I realise the angel looks a bit awkward from the photo, but I assure you all he was incredibly comfortable. 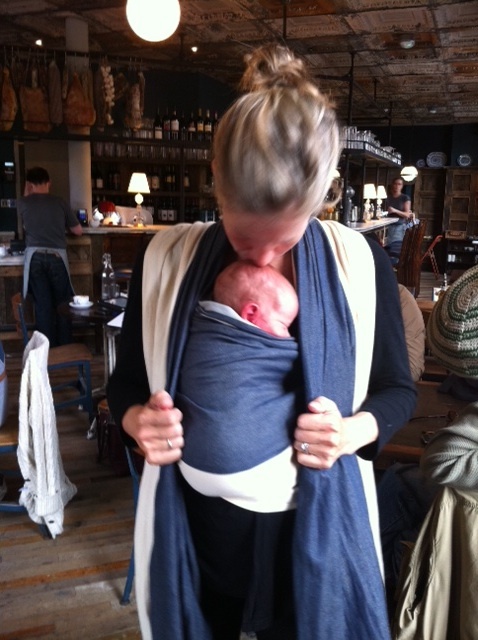 Usually you wear slings high, so you can kiss the top of the baby’s head (as illustrated above). 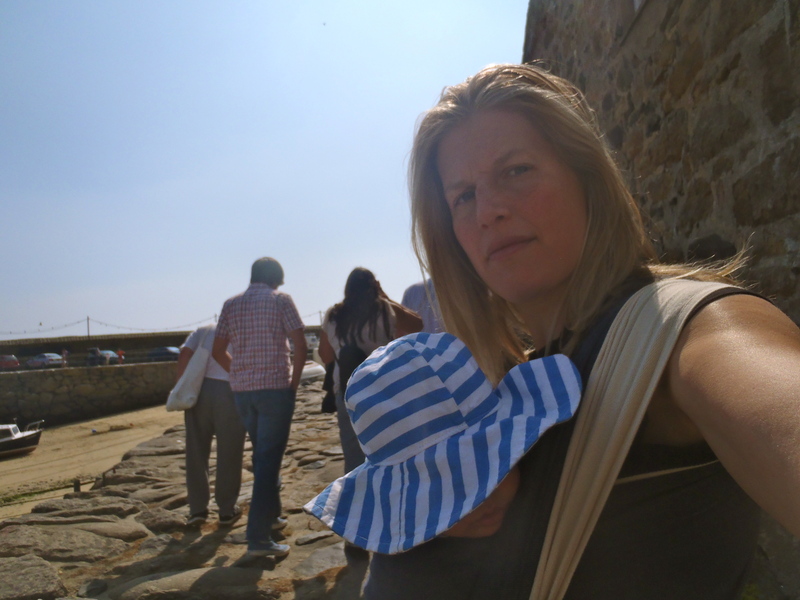 Here, however, as you can see, I have my 3 year old is on my shoulders, and so to prevent him kicking baby I loosened off the sling, so that I could carry both. Smiles all round! 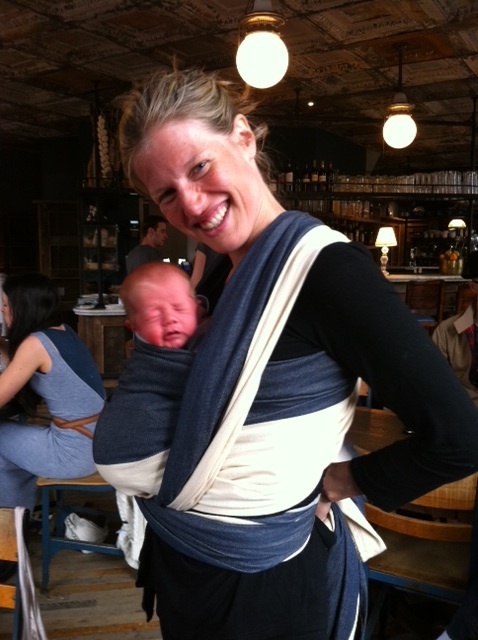 I hope these photos prove my point that you can still be very active with babies in slings. A final point, if a baby is not happy, he will CRY! So if baby is in the sling, (as long as you can see his mouth and nose, so you know he can breathe clearly) if baby looks like he’s lying in an awkward position, don’t worry! He’s fine. If he’s uncomfortable, he’ll tell you!! Thank you for the request Michael, I have really enjoyed sharing these pictures.